Bitstamp is a biggest European bitcoin exchange based in Luxembourg. It allows trading between FIAT currencies and various cryptocurrencies. Thanks to Trezor device, you can exchange your funds safely and in a more secure way. 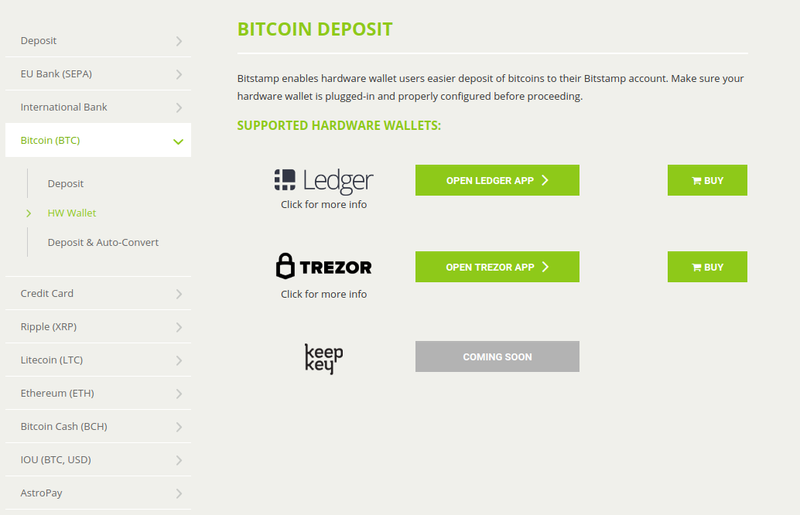 With Bitstamp, users gain a convenient new way to transfer bitcoins directly from their Trezor Wallet to an account. Bitstamp use Trezor Connect to communicate with Trezor device. 1. Log into Bitstamp account. 2. Go to Deposit -> Bitcoin -> HW Wallet -> Trezor. 3. Select the desired amount and click on "Deposit". 4. Connect your Trezor and follow the instructions. 5. Authenticate to your Trezor with PIN/Passphrase. 6. Choose the account you want to send the bitcoins from. 7. 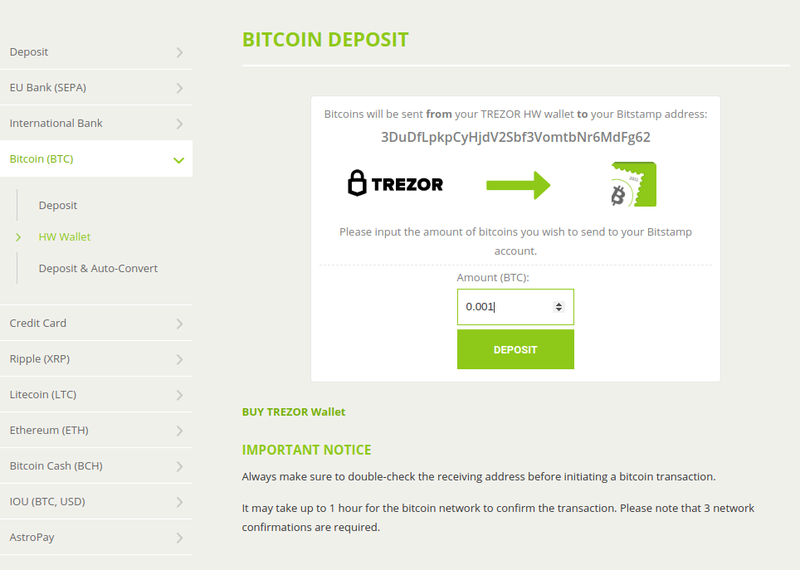 Check and confirm the transaction on the Trezor screen. Done. 2. Go to Withdrawal -> Bitcoin -> HW Wallet -> Trezor. 3. Connect your Trezor and follow the instructions. 4. Authenticate to your Trezor with PIN/Passphrase. 5. Choose the account you want to send the bitcoins to. 6. Select the desired amount and click on "Withdrawal". 7. Confirm the withdrawal transaction via received e-mail. Done. This page was last edited on 5 December 2018, at 16:40.